For the past few weeks Public Transport Victoria have been running 1/3 page advertisements in Melbourne’s mX newspaper to promote a new bus service. So why can’t I find a mention of it anywhere else? With buses from Oakleigh every 4 minutes on weekdays and and every 10 minutes on weekends, the Oakleigh bus service is the best way to get from the city to Chadstone Shopping Centre. Train services from the city to Oakleigh station depart every 10 minutes, seven days a week. Take the stress out of your Christmas shopping and relax knowing that a bus is always just around the corner. This service is prepaid meaning you have to have myki money or a valid myki pass before boarding. Customers who need to buy or top up a myki can do so at Oakleigh station or Chadstone Shopping Centre. Other than the advertisements in mX, finding any other mention of the new bus service is virtually impossible. 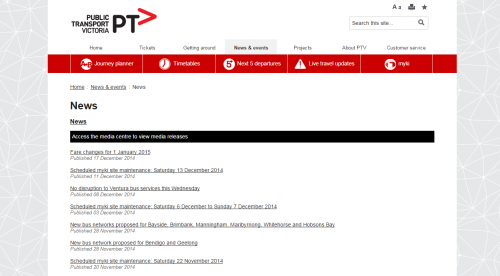 A check of the Public Transport Victoria website doesn’t bring up anything. 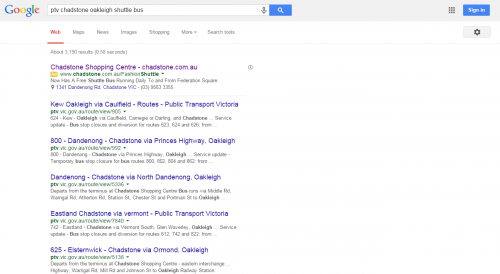 Searching Google for “ptv chadstone oakleigh shuttle bus” only brings up references to existing bus services in the area. The details of a “Free Chadstone Shuttle” also shows up, but this private bus service only runs a few times a day from the city and requires pre-booking – it appears to be targeted at tourists wanting to spend up big. Eventually, I found a tweet dated December 11 from bus operator CDC Victoria referencing the new service. 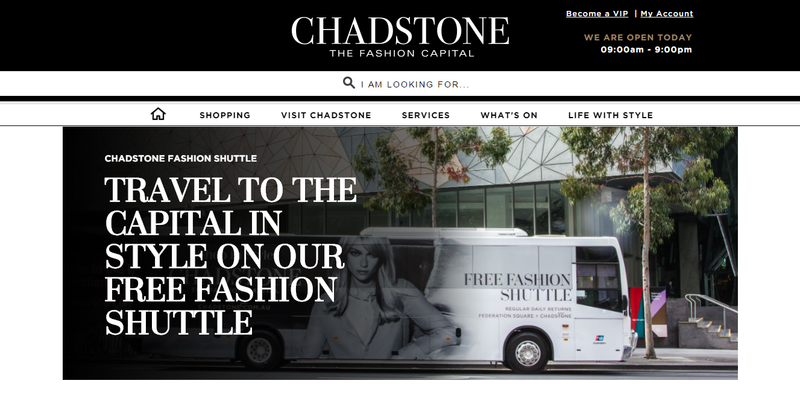 Did you know @CDCVictoria is running shuttle buses from Oakleigh Station to Chadstone Shopping Centre @fashion_capital from now to 27 Dec. 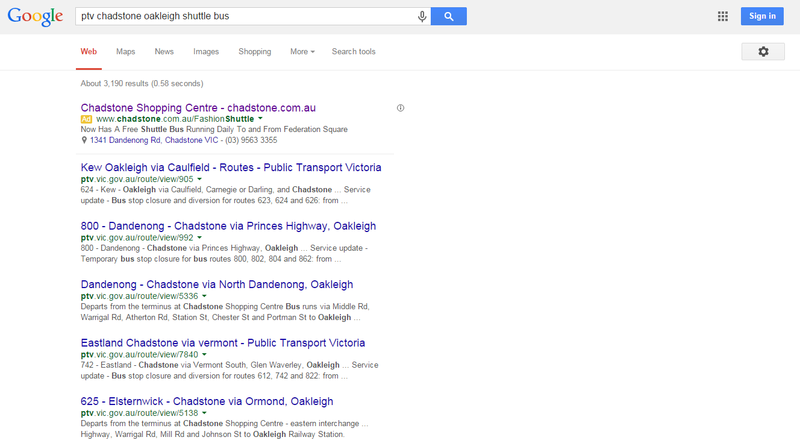 So why is Public Transport Victoria promoting their their new Oakleigh to Chadstone bus service so sparingly? Posters at Chadstone list all the services between Chadstone and Oakleigh and their freq.. So it’s not a special/new service, it’s all the services that already run.. Promoting the existing services and coordinating their departure locations would be the most cost effective way of improving services. There are labels in the underpass at Oakleigh station indicating the walkway from the platforms to the majority of the buses, though it doesn’t indicate that the 625 bus is an option. The ads doesn’t refer to the CDC shuttle, it refers to frequency of all the routes when you add them up. The CDC shuttle runs only limited hours. So the CDC shuttle only fills in the gaps between normal services, or just spends all day headed between the two locations?